I'm Ill What Can I Do? "They dont believe me when I say I am ill."
Some people who are living with illness deal with a lack of belief either from someone they love or from professionals - medical or otherwise. Sadly, disbelief and illness can go hand and hand. Even if someone does believe you are ill, you may feel disbelieved if they do not express sympathy and do not offer you help when you need it. Disbelief and invisible illness - "but you don't look ill"
Encountering disbelief can be all the more common or all the more upsetting for those living with invisible illnesses such as Chronic Fatigue Syndrome / Myalgic Encephalomyelitis (CFS/M.E). 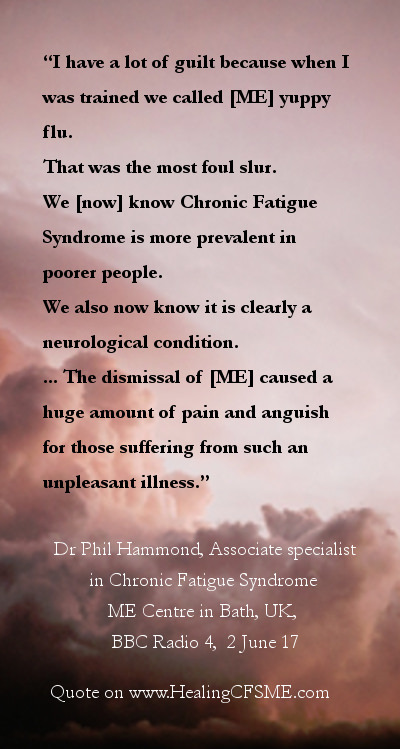 CFS / ME is one of the chronic illnesses where you may not look sick. There are many illnesses like this. Many people with cancer look wonderfully healthy. You may learn health management skills. You may find the right level of exercise for you - not too much exercise, not too little. 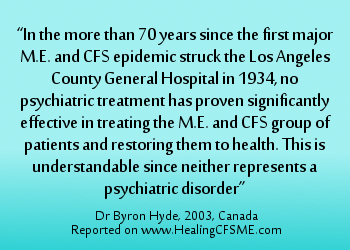 You may find a good diet for CFS/ME and take up alternative healing methods. It takes work to improve your health management. It can be so frustrating if your hard work is not acknowledged, and instead you are left feeling, "They dont believe me when I say I am ill."
It may help to remember that even if you had an illness with clear tests available and a clear treatment pathway, you might still have the experience that people don't believe you. No one can know how much pain or discomfort another person is feeling. It is crazy-making if you encounter disbelief when you are ill.
You may choose to use self healing methods to work to keep your sense of sanity. It can feel lonely to find out that someone is not willing to share your life with you once you live with illness. You may choose to find a physical or online community of people with the same chronic illness to bolster your sense of connection and of being seen and accepted as you are. You may feel angry with the people who don't believe you. You may switch between the early stages of grief – denial and anger – and in this way you may avoid the normal feelings of grief over being ill which help you to move forward in accepting an illness. What Can You Do About Disbelief and Illness? If you are experiencing disbelief in a time of illness, you may want to improve your communication skills. I recommend: The Dance of Anger by Harriet Goldhor Lerner. I have also read enough of Non-Violent Communication by Marshall Rosenberg to be able to recommend it highly. Both books have hundreds of 5 star reviews on Amazon. You can buy the books on Amazon using the links above. Learning communication skills can improve your chances of communicating your needs to another. But please know that there will be people who still don't believe you are ill even when you explain clearly and calmly. I know it can be hard, but please be willing to believe yourself even if someone else doesn't. You have little influence over another person. But you can work (or play) to overcome any disbelief about illness in your own mind. Here are some questions to get you started. Questions to ask yourself when you have the experience of "They Dont Believe Me When I Say I am Ill"
I have given answers to act as affirmations. “Do I believe I am ill? No. I am willing to take the lead. 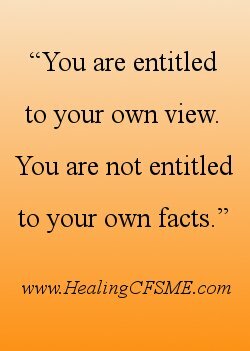 Positive self talk: What would you like someone to say to let you know they believe you are ill? What would you like someone to say to you to let you know they believe you are ill and have an understanding of what you are going through? What do you need to hear to overcome the pain of the 'They don't believe me" feeling inside yourself? Look in a mirror as you say the words. Alternatively, imagine yourself in your mind standing in front of you and let this new self tell you what you need to hear. Commit to saying these helpful words 30 or 40 times a day for a few days so they become a habit. Most importantly, engage in positive self talk at the very moment when you realise you need someone else to say it to you. Learn to be a good friend to yourself by using positive self talk to give yourself the belief and understanding you need. “I know the truth about how you feel right now. I am so sorry your health isn't good. I can see you are having a tough time. I want you to tell me the truth about how things are for you. Why would someone act as though they dont believe me when I say I'm ill? One of the reasons disbelief and illness can go together is because someone wants you to continue to play a certain role in their life. Click through to learn about the many family roles that are harder for you to play in a time of chronic illness. Get informed about the illness with which you live. If you get the chance, pass on some of this information to the person who is acting as though they don't believe you. For example, you can quote Doctors who speak about the severity of the illness you experience. 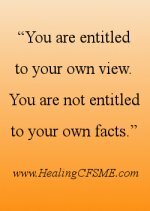 If you live with CFS/ME, click to read some appropriate CFS quotes. If you are living with chronic illness at a certain level of severity you may need to use a wheelchair or other disability aids. It is sometimes much easier for other people to show understanding and belief when you use such equipment. Read my healing poem which touches on the feelings of isolation that can accompany chronic illness. A great site by my colleague for Quotes about Moving On. What is a spoonie? - If you are living with chronic fatigue, you can explain that you have run out of spoons! 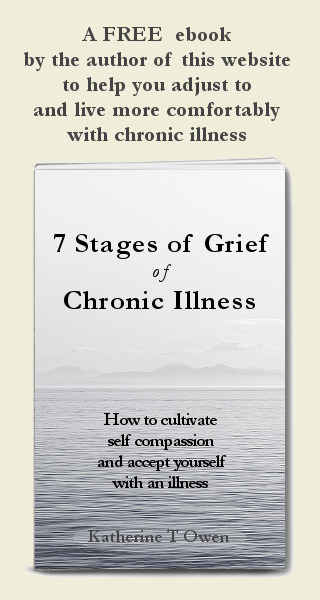 Move from "They Dont Believe Me when I say I am Ill" to collect your free ebook on the stages of grief of chronic illness.